March 17, 2015 - SOLD OUT! Shugar is a 65 lb yellow female born on April 29, 2011. Shugar is the daughter to D & S Harley Girl SH and White Oak's Ready to Rumble MH. Eager to please in the field and focused, Shugar has a super marking ability with medium drive. She can easily do multiple marks and retrieves to hand. She is calm in the house and gets along great with her ½ sister Foxy. 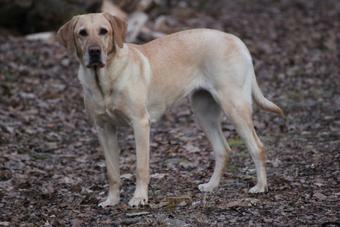 Shugar earned her Junior Hunt Title on November 3, 2012 and earned her Senior Hunt Title on July 19, 2013. Shugar most recently earned her Master Hunt Title on October 5, 2014. This will be Shugar’s first litter of pups. 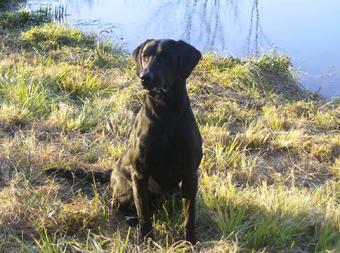 Shugar is owned by Frank Reightler and trained at D & S Retrievers. Dew claws will be removed on March 20, 2015. Pups will be wormed at 3, 5 & 7 weeks of age, and pups will received their 6 week vaccines and were vet checked and certified by Dr. Sam Yoder of Silver Maple Veterinary Clinic. Born and raised in our home....well socialized. Ready for new homes on May 8, 2015.